"This dish is for when you want to fuss a bit" is how Deborah Madison begins her intro to the recipe. True. It’s also for when you want incredible, lingering aromas in your kitchen and a richly flavored sauce. I would also say this is a mind-changing meal for anyone who thinks vegetables are boring. I read Local Flavors last summer and made use of some local bounty with a few recipes from the book. I also tucked this recipe into the back of my mind for when winter arrived. 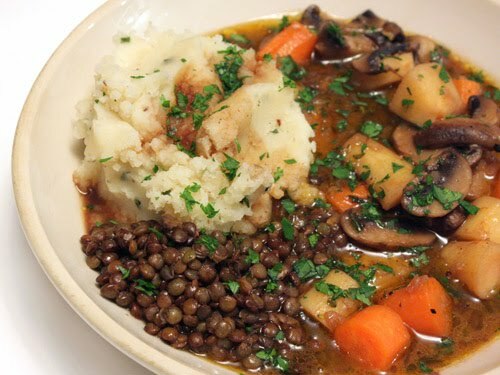 The stew is made with parsnips, carrots, mushrooms, and herbs, and it’s served with lentils and potato puree. I just happened to have some du Puy lentils sent to me by my favorite Parisian cowgirl and a little package of dried porcini from our nearby Italian market, and the time had come for a slow-braised meal. So, yes, there was some fussing and use of several pots and pans and lots of chopping, but it was all very simple and very worth it. You begin with the sauce which contained a lot of the same ingredients as the braised vegetables. You can use the trimmings from the mushrooms and parsnips which will be braised in the next step. Those trimmings were combined with onion, carrot, celery, garlic, thyme, a bay leaf, and some rosemary and were cooked in a large pot until the vegetables browned. Meanwhile, dried porcini were rehydrated in warm water. After the vegetables browned, tomato paste, flour, red wine, and the porcini and the soaking liquid were added. That was left to simmer for 45 minutes, it was then strained and further simmered to reduce a bit, some soy sauce was added, and butter was whisked into the sauce. See, that was easy, but just a little fussy, right? When you smell the sauce simmering, though, and I have to pause on that memory for a moment, you won’t mind. Next, it was on to the braised vegetables. Carrots, shallots, and parsnips were browned in a wide skillet. Mushrooms, a bay leaf, thyme, and minced rosemary were added. Some of the sauce was poured over the vegetables, and they were simmered for 25 minutes. At the same time, the lentils were cooked in water and drained, and then butter and some sauce were added. One more step would have been preparing potato or rutabaga and potato puree, but I got lucky here. I had some leftover mashed potatoes in the freezer which made quick work of that part of the dish. Certainly, this could be prepared over the course of a couple of days. You could prep all the vegetables and start with the sauce one day, and then wait to braise the stew vegetables and cook the lentils the next day. The potato puree was mounded in a wide, shallow bowl. Some lentils were placed next to it, and the vegetables nestled all around in the red wine sauce. I would argue this dish was the boeuf bourguignon of the vegetarian world. The sauce’s flavors were layered and complex. The braised vegetables and lentils were steeped in those flavors, and the potato puree rounded out this ideal, winter comfort food. Next time I decide I want to 'fuss a bit,' I’ll at least double the quantity of sauce so I can stock my freezer for a lazy day. Puy, if I remember correctly, hold their shape particularly well, so I guess I should not substitute another kind. Had some lentil stew today too. Yours looks so delicious. Love meatless, hearty dish like this. Growing up, I never once thought that I would come to love something that I thought, as a child, as ugly as lentil. Now I can't have enough of it. Your recipe came in a bit late. I just turned my last box of Sabarot lentils into lentil sprouts last week. Waaaaah. Must add lentils to this weeks gorcery list. Looks delish. I'm loving the red wine sauce, too. I think dried porcini mushrooms do something exceptionally special to soups and stews - I can imagine their earthy flavor is a wonderful match with the lentils - and with potato puree to boot? Ahh, bring it on and I wouldn't care about the fuss because I couldn't PAY for something as wonderful as this! I love puy lentils. Thanks for a delicious sounding and looking recipe. I look forward to trying it out. Puy lentils are great for this as they hold their shape more than some others. Your pictures are great - clear and descriptive in themselves! Where can we get the recipe. I'll like to try this. I love du Puy lentils. They are more delicate in flavors. Oh Yum! These look so good (as I am sitting in a hotel room eating crackers and cheese because I am too lazy to go out). I love de Puy lentils. What a pretty dish and so perfect for a cold day - yum! It looks so delicious, it's hard to believe that it is vegetarian. YUM! I love French lentils. They keep their shape so much better than other types. And they cook up so quickly. This is my ideal winter supper. Lisa - I want a big bowl of that right now! This is why people can be intimidated by vegetarian food though - so much work, so many different steps. Much more complicated than throwing a steak on the grill. But I bet if most people tasted this dish, they would be more willing to try vegetarian food. Great (and delicious) job! I have been wanting to cook lentils but can't seem to be getting the right product in stores. There seems to be a variety of them and some requires more cooking time than the others. Any tips? This is a very hearty dish! Deborah Madison is, I'm pretty sure, a genius. This dish looks amazing! It combines all of my favorite root veggies with lentils, which are also delicious. Great combination of things. I would definitely like to have some of this in the freezer. wow. before now, i would've argued that no vegetable-centric dish would be worth such time and effort, but as you've described this, i think it must be heaven in a bowl. excellent post, lisa! tigerfish: French du Puy lentils will become tender after simmering for about 20-25 minutes, but brown lentils take a little longer. Red lentils, which are really delicious, are a little different. The red type cooks very quickly and tends to fall apart. Those end up a little mushy, but they're great in their own way. Good luck with your lentils! Hi again! Please check my blog for a gift! Oooh yum - this looks delish! Fantastic! I've used red, brown and beluga lentils but have yet to try French du Puy. Shamefully, I also haven't been taking advantage of root crops this season. This should inspire me. Love your presentation - so rustic and incredibly appealing. I'm ready to just dig in! This is just my type of dish. Sounds so appealing! I love the combination of root veggies and lentils. YUM! What a fabulous meal! I can practically smell it from here. 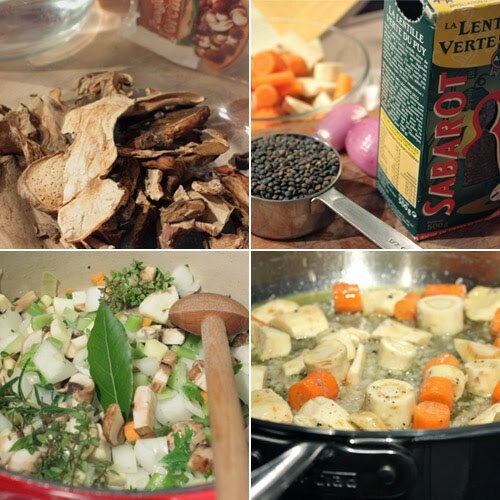 I love lentils and your presentation is perfect- the photos are great. I'd really like to make this, but I'll be darned if I saw the actual recipe here. Did I miss something? What a beautiful winter dish, so rich and warm looking. And satisfying too! Helene and Barbara: I don't actually re-print copyrighted recipes from books. I include links to recipes that are published online, or I include links to books where the recipes are found. If I make significant changes to combine multiple recipes, then I post my versions. But, in this case, I didn't make any changes. Lentils can be so wonderful and warming. 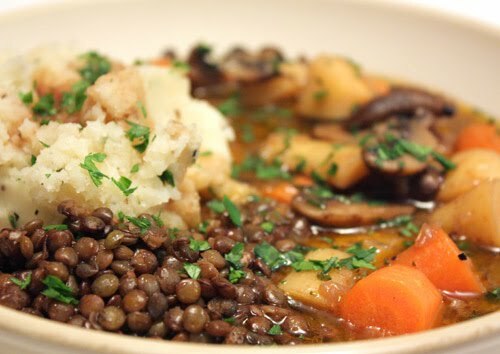 My mother in law makes the most fabulous lentil dish, its a great comfort food. This dish looks excellent. Oh this looks so absolutely comforting. I could sit and enjoy a bowlful of this esp. during this turn of weather.